The T30 temperature controller is a simple, cost effective solution to control temperature of low voltage and medium voltage dry and cast resin transformers. 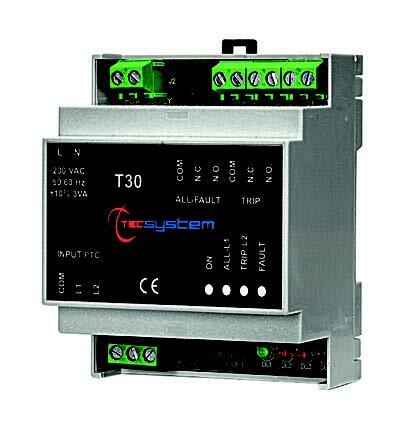 The T30 comes with 2 inputs suitable for Ptc thermistors for alarm and trip. The input channels are protected from electromagnetic interference for consistent, reliable operation. 2 output relays (ALL/FAULT, and TRIP) are available and the 4 front panel LEDs display the status of the system. The fault circuit trips in case of sensor failure or if the board self diagnostics detects a problem so it may be quickly remedied.